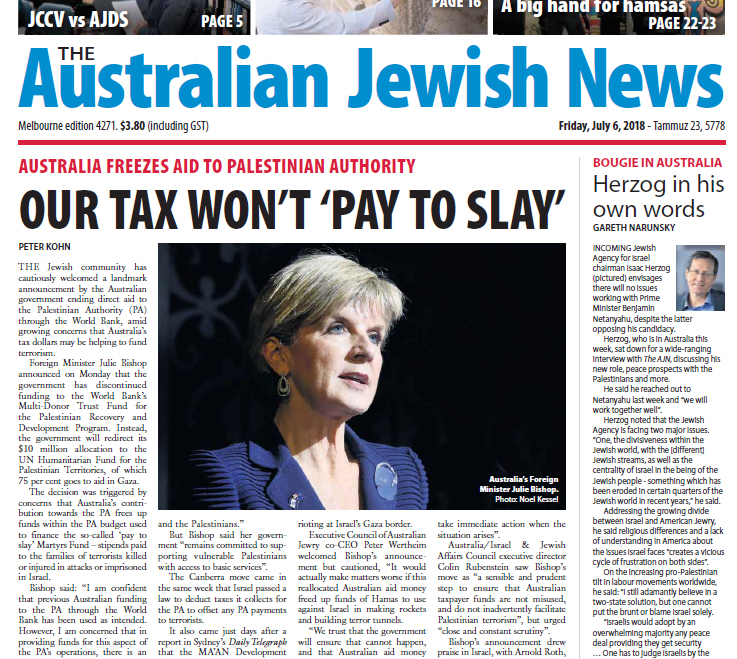 A front page story ["Australia freezes aid to Palestinian Authority | Our tax won't 'Pay to Slay'"] in the July 6, 2018 edition of the Australian Jewish News (we subscribe to the electronic edition which emerges before the print version does) deals with a welcome and important move to reconsider foreign aid funding of the Abbas PLO/Fatah regime. 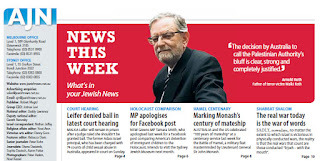 Executive Council of Australian Jewry co-CEO Peter Wertheim welcomed Bishop’s announcement but cautioned, “It would actually make matters worse if this reallocated Australian aid money freed up funds of Hamas to use against Israel in making rockets and building terror tunnels. 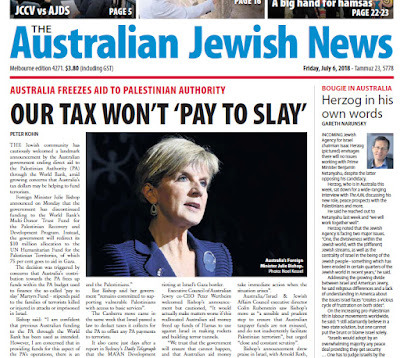 “We trust that the government will ensure that cannot happen, and that Australian aid money will be applied directly only to projects that the PA or Hamas would not otherwise have to fund themselves, and from which they derive no political benefit.” Zionist Federation of Australia president Danny Lamm described Bishop’s decision as “a strong sign that the government is taking this issue very seriously and will take immediate action when the situation arises” ...But Bishop said her government “remains committed to supporting vulnerable Palestinians with access to basic services”... [The announcement] came just days after a report in Sydney’s Daily Telegraph that the MA’AN Development Centre, a Palestinian organisation receiving Australian aid through Union Aid Abroad-APHEDA, an Australia trade-unions charity, employed Ahmed Abdullah Al Adine, a senior figure in the Popular Front for the Liberation of Palestine, which has a decades- long record of terrorism. 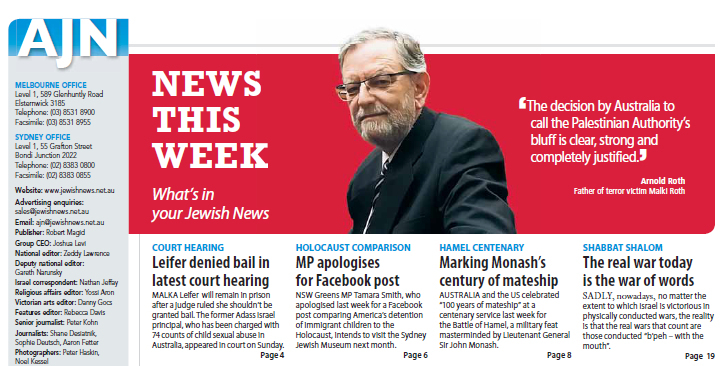 Al Adine was killed in May during rioting at Israel’s Gaza border... Bishop’s announcement drew praise in Israel, with Arnold Roth, whose Australian-born daughter Malki was murdered by Palestinian terrorists in 2000, describing it as “completely justified”. Completely justified is an accurate way of conveying what Arnold Roth said to the AJN reporter. The decision by Australia to call the Palestinian Authority's bluff is clear, strong and completely justified. For years, the Palestinian Authority has given canned answers to critics of its rewards scheme whose real purpose is clearly to encourage Arab-on-Israel terror. They call them pensions for "prisoners of war" and "social welfare" payments for their needy dependents. That this is sand-in-your-eyes nonsense can be seen from how the monthly payments and other benefits rise sharply according to the seriousness of the act of terror with the highest monthly salaries going to the vilest killers. It's not credible that governments, Sweden for instance, who accept the PA’s assurances, believe what they are being told. To me, it’s evident that they need to pretend to believe. Congratulations to Ms Bishop and Australia's government for showing they're made of much better stuff. 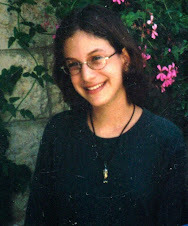 For a sense of how outrageous the PA's scheme is, my daughter Malki's murder in 2001 involved several terrorists who today have high public profiles in the Arab world. I consulted Itamar Marcus of the authoritative Palestinian Media Watch organization who told me the terrorist who made the exploding guitar case for the Sbarro pizzeria attack where Malki was murdered, Abdallah Barghouti, has so far earned more than US $180,000 from the PA. He is serving 67 life terms. 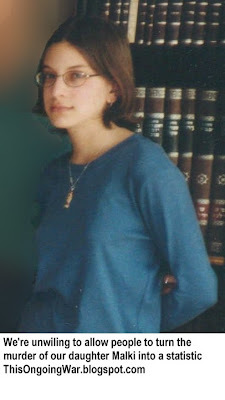 Ahlam Tamimi, the Sbarro massacre mastermind, was sentenced to 16 terms of life imprisonment but walked free in the 2011 Shalit deal. She lives in Jordan today as a celebrity. My wife and I are working with US government authorities to have her extradited to Washington to face trial on US terrorism charges. Palestinian Media Watch says she was paid US $53,000 during her decade behind Israeli bars. Her husband, himself a murderer who spent nearly two decades behind bars, received much more. The parents of Izz Al-Din Al-Masri, the human bomb whom Tamimi brought to Sbarro, are monthly beneficiaries under the PA scheme. Payments to them reached about US $50,000 as of last month. and on it goes in the usual, sadly predictable way. Mr Abdulhadi probably hopes you won't look into his claims and become better informed about how the Palestinian Authority's long-established incentive scheme for more terrorism works. We have written often about what we call the Rewards For Terror scheme - see these links. A good starting point for understanding what it does is "Palestinian Authority “Pay for Slay” Fact Sheet" from the fine Endowment for Middle East Truth organization in Washington DC. Israeli Soldier Saves Houston Boy - A feelgood story. Because right now, I am sure we could all do with one.